FOR CMST STUDENTS: To find Hodson Hall-024, enter on the east side of Hodson Hall at the end of the building that faces the gym. The classroom is the last door on the left--across from the entrance to Tarro Theatre. FOR JOUR STUDENTS: Reeves Hall is at the northwest corner of campus and has a radio antenna tower on the east side of the building. Reeves-022 is a newsroom shared by SVC's radio station (KSVR) and The Cardinal newspaper. Do you need help with speech anxiety? Current SVC students--even those not enrolled in one of my courses--can meet with me for access to speech anxiety resources. I am happy to chat with you about strategies and tools that can help you manage physiological symptoms and stress associated with giving oral presentations and/or performing. EDUCATIONAL BACKGROUND: I graduated from Burlington-Edison High School. I received a Bachelor of Arts in Written and Verbal Communications and K-12 teaching credentials from Seattle Pacific University and both a Master of Arts in Speech and a fifth year in Education from Western Washington University. PROFESSIONAL BACKGROUND: In addition to teaching at SVC, I taught briefly at Seattle Pacific University, Embry-Riddle Aeronautical University, Western Washington University, Cascades Job Corps Center, and several high schools between 1978-1993. SVC EXPERIENCE: I have been an instructor in the Communication Studies/Speech department at Skagit Valley College since 1989, full-time since 1997. I commonly teach Interpersonal Communication, Public Speaking, Journalism, learning communities, and integrative experiences that combine communication with poetry or feminism. I also work with students on strategies to overcome speech anxiety. PERSONAL: I like poetry, travel, people-watching, movies, reading, genealogy, pie, and living in the Skagit Valley. I'm also a Mariners and Seahawks fan. 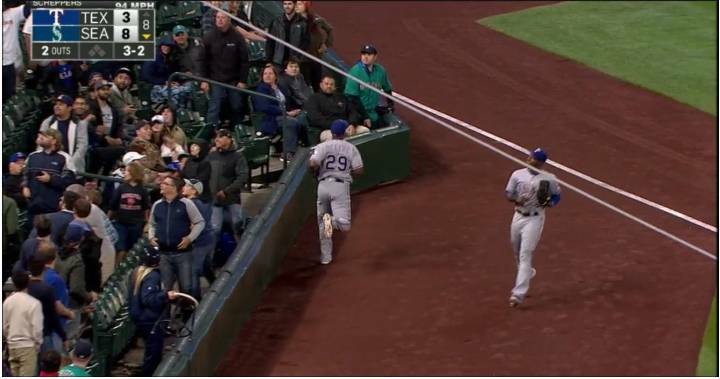 Can you spot me at this September 2016 Mariners game?